Hundreds of people have taken part in a number of demonstrations on the Irish border in opposition to Brexit. 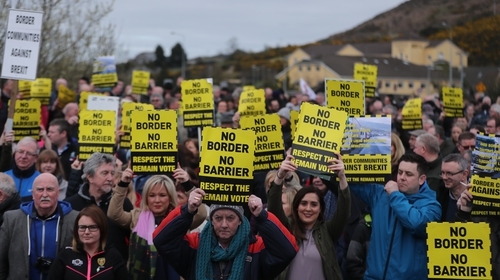 Border Communities Against Brexit organised the protests to mark the day after Britain had been due to leave the European Union. Border demonstrations took place along a number of crossing points in Co Tyrone, Co Louth, Co Donegal, Co Fermanagh, Co Cavan and Co Monaghan. Demonstrators set up a mock check-point on the Old Dublin Road in Carrickcarnon which was manned by people dressed as customs officers. The road was closed to members of the public as protesters carried anti-Brexit placards and EU flags. Sinn Féin president Mary Lou McDonald was joined by party vice-president Michelle O'Neill and Newry and Armagh Sinn Fein Assembly member Conor Murphy. Border Communities Against Brexit spokesman Declan Fearon warned a crash Brexit is "increasingly likely". He said: "A border in the past meant this road was closed for over 40 years and this community was divided. "We won't allow the very hard right-wing Tories and the ERG (European Research Group) and especially the DUP to destroy this community and bring us back to days when this was an economic wasteland." Around 300 people gathered at the border on a road that was closed during the Troubles. Many similar protests were staged on various border points between Northern Ireland and the Republic. Colin Harvey, a professor of human rights law at Queen's University Belfast School of Law, said he is against any attempt to "undermine or attack" the Good Friday Agreement. He said: "We have long experience of people trying to put walls in our way and we take them down. "If anybody attempts to put barriers on this island again they are coming down. Any obstacles on this island will be removed. "We as a society are used to people putting up mountains for us to climb and we will continue to climb them. There will be no hard border on the island of Ireland. "We are going to be the generation who ends the major division on this island, who can achieve the unification of our own country and we are going to get there." Ms McDonald said: "We are at a very dangerous moment where we inch ever closer to the real possibility of a crash and a chaotic Brexit. "At this stage people should understand how serious that would be for all of us. "The reality is that Brexit in any form is a disaster for the island of Ireland." She also accused the DUP of being "seduced" by Westminster. She added: "The people who live in the north of Ireland wish to continue in a society that is someway prosperous, that's stable and many people identify not just as Irish but also as Europeans. They did not consent to Brexit. "They will never, never, never give up on that point either."